A few minutes ago I learned that a grieving Mom took her life. 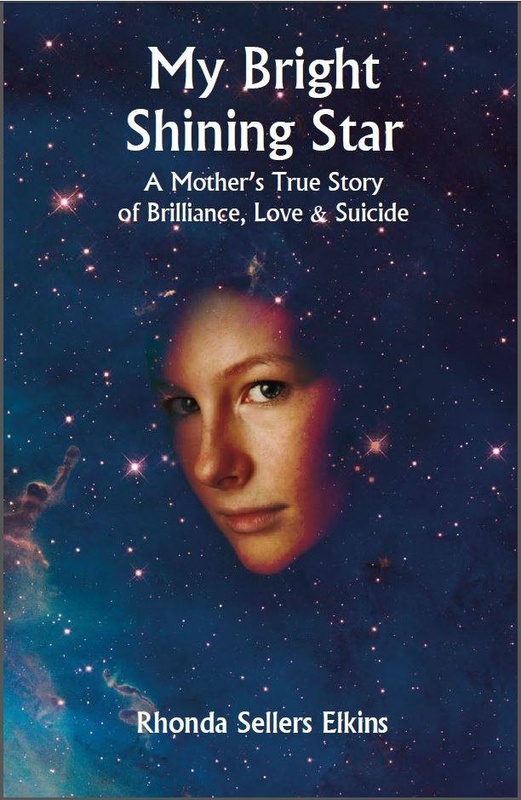 Many of you may have followed Rhonda Elkins blog, My Bright Shining Star, or read her book, My Bright Shining Star: A Mother’s True Story About Brilliance, Love And Suicide, which was dedicated to her beautiful daughter, Kaitlyn, who died a few months before Amy. Kaitlyn was a brilliant 23 year old medical student who took her own life. Rhonda was equally as brilliant in my eyes. Rhonda and I exchanged emails for a bit and shared the pain of losing our daughters. After her book was released, which was 1 year after Kaitlyn died, I lost contact with Rhonda, but not before fulfilling my promise to her to write a review of the book on Amazon. Quite honestly, I do not remember ever writing a review before but her book was so powerfully written that I was happy to oblige. Rhonda’s book was a love story with a tragic ending. As I read this book, many times needing to stop because I was sobbing, I felt the love and despair as if Rhonda was standing in front of me and telling me her story. Rhonda’s goal was also to educate others and shine a light on the incidence of suicide among high achievers, particularly those in the field of medicine. The pain of losing a child is devastating. When I drone on and on about the pain on the other side of Devastation Day it’s because it does become unmanageable at times and more than a person can handle. I have no way of knowing what Rhonda was doing to manage her sorrow, but I do know she was writing every day and she was trying to raise awareness to save others from her daughter’s fate. I do know she was doing everything she could to honor her daughter too. My heart is breaking for Rhonda’s family. My heart is breaking for Rhonda during the time leading up to this decision. The world lost another bright shining star on Friday. I am deeply saddened to learn of the loss of Rhonda Elkins. There really are no adequate words to describe just how very sad I am that Rhonda decided she could not stay here. To my fellow grieving parents, please don’t give up … believe me, I know how difficult it is to live without one of your children. I wish Rhonda could have found another way. Today, like any other day, I remember Amy … As well as two bright shining stars. ← Another Day In Paradise! This is so very, very sad. We know how devastating the pain of losing a daughter (or son) truly is and, like you Dee, I wish that Rhonda had found a way to survive this pain. Yet, on some level, I do understand. Isn’t that frightening? No one knows the deep sorrow on the other side of Devastation Day except those who have lost a child. We have to fight to survive while learning to co-exist with unimaginable pain in a world which will never be the same. I am so, so sorry too. There aren’t any words for such sadness. Dee, sadly I heard this from another grieving mother who lives in North Carolina. She had no idea that I knew of Rhonda but I had made a connection when she first began blogging. I even sent her an ornament for her Christmas tree last year in memory of Kaitlyn. One thing I am certain of is that Rhonda would disagree with people saying it was a “choice” when it is clearly not, even though it appears to be. One thing I have learned is that mental illness is not a choice. Rhonda also was dealing with her own mental illness/depression on top of her grief. She died as a result of that but it was more of a dark impulse than a deliberate intelligent decision. As much as I wish life was over on any given day…I remember the rawness of new grief in those first years. I wanted to die but did not have the courage or the mental incapacity to do it. It is not so much that I chose to live but that my will to die would not be by my own hands. On some days I still pray that God would just come and get me. My son was also in the medical field, as was Rhonda. Both nurses. Brandon was also a high achiever with great aspirations that sometimes seemed delusional for him but he pressed onward. His creativity was another factor as it was for Kaitlyn who wrote poetry. So much to consider in all of this. When people have the disadvantage of mental illness already, it doesn’t take but one cataclysmic thing to put them “over the edge.” I believe Rhonda held on for as long as she could but depression held on with a mighty grip. I am so very sad to know of her death. I pray for her husband and daughter who have lost two of their family to mental illness. It is also genetic and can manifest at any time in one’s life. I pray there is no more. I tried very hard not to judge or make any assumptions when I wrote my post about Rhonda’s suicide and am hoping I was successful in doing that. Hearing the tragic news about Rhonda’s suicide prompted me to re-read some of our email exchanges and I am grateful for those communications with Rhonda and the opportunity I had to get to know her. My heart breaks for her daughter, Stephanie, her husband and the loved ones she leaves behind here as they are all still mourning their Kaitlyn. Rhonda’s death is utterly heartbreaking. I wish I could somehow protect her daughter, Stephanie, and her husband from the unspeakable pain. I’m just so sorry for everyone. What horrible news for this family. I used to say that I couldn’t believe there wasn’t even a thread of some sort of connection or hope that could keep a person from choosing suicide. I used to believe that nothing could ever be so bad that love and support couldn’t be enough to keep you going one more day and then one more. I’ve learned that I can never again judge another’s person’s actions. No matter how devastating this loss, she obviously saw no other option. My prayers are for her family now and that she is with her beautiful daughter in a place of beauty and love. Mira, you are so right. Losing a child changes how you think and feel about everything. I too hope that Rhonda is at peace and with Kaitlyn but I will always think of those she left behind too. Rhonda has found the peace she so desperately craved. She was a great blogger and I will miss her writing and support. Thank you for this beautiful post on Rhonda and the sensitive manner in which you wrote it. Rest in Peace dear Rhonda. I know you are with your precious Kaitlyn. Yes, rest in peace, Rhonda. Thank you for stopping by my blog and reading my little memory of Rhonda. I’m truly sorry for your loss of Amy too. This, as I know for those who knew Rhonda hits me hard. To close to home I say. I’m growing weary of the loss of precious life from Mental/Emotional illness and suicide. It has made me do more soul searching, and having more talks with my Higher Power as to why this happens. The only way I can feel is that our lord has a higher purpose for Rhonda, Amy, and Kaitlyn in heaven then here on earth. With 2 failed attempts myself, I ask him, “Why am I still here and their not”? I guess I have more work to do here, to try and help others find a better path living with mental illness and disorders then suicide. I know it sounds blunt, but I feel that is my God given purpose of why I’m still here. Having dual diagnosis, meaning living in recovery from addictions, and battle mental illness is a daily challenge for me, but I know I can not give up! I have to continue to Raise Awareness, Speak out, inform, and educate the public on the dangers of addictions, and living with mental illness. Just as Rhonda will continue her work in heaven. Her star my not shine on earth, but I have faith and comfort knowing it is brilliant in heaven! Catherine, thank you for your thoughtful post on my blog. While Amy did not take her own life, my father did so I do have some understanding about the complicated grieving that happens when a loved one commits suicide. Losing my daughter has rocked me to my core and I remember contacting Rhonda as a grieving Mom who also lost her youngest child. I am sure I shared with her how my father died though. It had been said to us that it was almost as if God just came and took my daughter home. That could be the case but I am just an ordinary woman who misses her daughter so right now since I don’t know that to be a fact, I am not able to get total comfort from that theory. I wish you peace and love on your journey here and I, too, hope that all of this will make sense some day when we arrive safely on the other side. So sad. There are no words. So tragic and while i did not know of her or her story it is a story many of us know too well. I thought about taking my own life in the early days and weeks after my only child died; but I kept hearing “don’t give up” “there is work to do” – like Rhonda and some of you – found purpose through writing. It’s cathartic and relevant to our healing. Prayers for you all as we continue on this journey connected by words and tears. I hear you. For me, it’s not that I want to end my life; i just want to end the pain. The real struggle for me personally has been this second year without Amy. Rhonda was only four months farther along than I am. My north stars are my loved ones here. Ending my life is not an option; however, living with the pain is a real challenge. Peace to all who come across this posting and know the pain I am referring to which ended another grieving mom’s life. Please don’t give up. We all feel so agrieved at this ending, but I just hope Rhonda has found the peace she so desparetely was searching for. I just needed to say how sorry to have heard this but having to hear it months after makes me even more sad and sadder that we didn’t keep in touch.My old friend called me yesterday to share this saddness.Which I cried allthrough out the day and night. MY friend and I introduced her and Allyn 34 years ago.I just heard of this yesterday and I am so sick to my stomach. I worked along side of her at the Golden Corral for so many years. We were buddies. I just wished we had kept in touch more often. She was the most kind person. I have enjoyed reading several comments about her and what she meant to Each of you.I can’t imagine how and what Alyn is going through. I AM SO SORRY. LOVE YOU GUYS FOREVER. LOVE Diane Meadows Coletti. Sending hugs to family.